Author vaughanbellPosted on October 26, 2015 October 26, 2015 Categories Togetherness5 Comments on What do children know of their own mortality? According to the Washington Examiner, republican presidential candidate Jeb Bush has said that doing a psychology major will mean “you’re going to be working a Chick-fil-A” and has encouraged students to choose college degrees with better employment prospects. If you’re not American, Chik-fil-A turns out be a fast food restaurant, presumably of dubious quality. “The number one degree program for students in this country … is psychology,” Bush said. “I don’t think we should dictate majors. But I just don’t think people are getting jobs as psych majors. Firstly, he’s wrong about psychology being the most popular degree in the US. The official statistics shows it’s actually business related subjects that are the most studied, with psychology coming in at fifth. He’s also wrong about the employment prospects of psych majors. I initially mused on Twitter as to why US psych majors have such poor employment prospects when, in the UK, psychology graduates are typically the most likely to be employed. But I was wrong about US job prospects for psych majors, because I was misled by lots of US media articles suggesting exactly this. There is actually decent research on this, and it says something quite different. Georgetown University’s Centre on Education and the Workforce published reports in 2010 and 2013, called ‘Hard Times: College Majors, Unemployment and Earnings’ where they looked at exactly this issue. They found on both occasions that doing a psych major gives you employment prospects that are about mid-table in comparison to other degrees. Below is the graph from the 2013 report. Click for a bigger version. Essentially psychology is slightly below average in terms of employability. 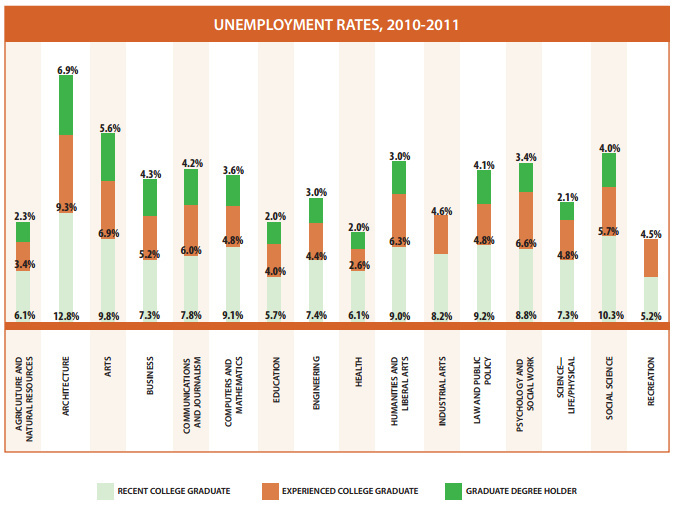 Tenth out of sixteen but still a college major where more than 9 out of 10 (91.2%) find jobs as recent graduates. If you look at median income, the picture is much the same: somewhat below average but clearly not in the Chik-fil-A range. What’s not factored into these reports, however, is gender difference. According to the statistics, almost 80% of psychology degrees in the US are earned by women. Women earn less than men on average, are more likely to take voluntary career breaks, are more likely to be suspend work to have children, and so on. So it’s worth remembering that these figures don’t control for gender effects. So when Bush says “I just don’t think people are getting jobs as psych majors” it seems he misthought. Specifically, it looks like his thinking was biased by the availability heuristic which, if you know about it, can help you avoid embarrassing errors when making factual claims. I’ll leave that irony for Jeb Bush to ponder, along with Allie Brandenburger, Kaitlin Zurdowsky and Josh Venable – three psychology majors he employed as senior members of his campaign team. MP tricked into condemning a fake drug called ‘Cake’ on Brass Eye has been put in charge of scrutinising drugs policy in the UK Parliament, reports The Independent. What starts as satire is so often reborn as policy. Narratively takes a look at the human stories behind the alarming rates of prescription opioid addiction in Appalachia. Mental health research makes good economic sense, argues The Economist. American Civil Liberties Union are suing the psychologists who developed the CIA torture programme. Before 6 months, babies don’t relate touch to an event outside of themselves. We’re calling this “tactile solipsism”. Interesting Brain Decoder piece. Mashable reports that Sesame Street debuts its first autistic Muppet. And try watching that What My Family Wants You to Know About Autism video without welling up. ‘Mental patient’ Halloween costumes: a scientific guide to dressing accurately. Important evidence-based Halloween advice on Brain Flapping. The Scientist looks back at Camillo Golgi’s first drawings of neurons from the 1870s. A fantastic eight-part podcast series called Missing has just concluded and it’s a brilliant look at the psychology and forensic science of missing people. It’s been put together by the novelist Tim Weaver who is renowned for his crime thrillers that feature missing persons investigator David Raker. He uses the series to investigate the phenomenon of missing people and the result is a wonderfully engrossing, diverse documentary series that talks to everyone from forensic psychiatrists, to homicide investigators, to commercial companies that help you disappear without trace. Missing people, by their absence, turn out to reveal a lot about the tension between social structures and individual behaviour in modern society. Highly recommended. Link to Missing podcast series with iTunes / direct download links. Mother Jones has a fascinating article on how America is attempting to stop school shootings by using community detection and behavioural intervention programmes for people identified as potential killers – before a crime has ever been committed. It is a gripping read in itself but it is also interesting because it describes an approach that is now been rolled out to millions as part of community counter-terrorism strategies across the world, which puts a psychological model of mass-violence perpetration at its core. The Mother Jones article describes a threat assessment model for school shootings that sits at an evolutionary mid-point: first developed to protect the US President, then to preventing school shootings, and now as mass deployment domestic counter-terrorism programmes. You can see exactly this in the UK Government’s Prevent programme (part of the wider CONTEST counter-terrorism strategy). Many people will recognise this in the UK because if you work for a public body, like a school or the health service, you will have been trained in it. The idea behind Prevent is that workers are trained to be alert to signs of radicalisation and extremism and can pass on potential cases to a multi-disciplinary panel, made up of social workers, mental health specialists, staff members and the police, who analyse the case in more detail and get more information as it’s needed. If they decide the person is vulnerable to becoming dangerously radicalised or violent, they refer the case on the Channel programme, which aims to manage the risk by a combination of support from social services and heightened monitoring by security services. A central concept is that the person may be made vulnerable to extremism due to unmet needs (poor mental health, housing, lack of opportunity, poor social support, spiritual emptiness, social conflict) which may convert into real world violence when mixed with certain ideologies or beliefs about the world that they are recruited into, or persuaded by, and so violence prevention includes both a needs-based and a threat-based approach. This approach came from work by the US Secret Service in the 1990s, who were mainly concerned with protecting key government officials, and it was a radical departure from the idea that threat management was about physical security. They began to try and understand why people might want to attempt to kill important officials and worked on figuring out how to identify risks and intervene before violence was ever used. The Mother Jones article also mentions the LAPD Threat Management Unit (LAPDTMU) which was formed to deal with cases of violent stalking of celebrities, and the FBI had been developing a data-driven approach since the National Center for the Analysis of Violent Crime (NCAVC) launched in 1985. By the time the Secret Service founded the National Threat Assessment Center in 1998, the approach was well established. When the Columbine massacre occurred the following year, the same thinking was applied to school shootings. After Columbine, reports were produced by both the FBI (pdf) and the Secret Service (pdf) which outline some of the evolution of this approach and how it applies to preventing school shootings. The Mother Jones article illustrates what this looks like, more than 15 years later, as shootings are now more common and often directly inspired by Columbine or other more recent attacks. It’s harder to find anything written on the formal design of the UK Goverment’s Prevent and Channel programmes but the approach is clearly taken from the work in the United States. The difference is that it has been deployed on a mass scale. Literally, millions of public workers have been trained in Prevent, and Channel programmes exist all over the country to receive and evaluate referrals. It may be one of the largest psychological interventions ever deployed. Link to Mother Jones article on preventing the next mass shooting. The Lancet Psychiatry has a fantastic article giving a much needed cultural retrospective on the wave of antidepressants like Prozac – which first made us worry we would no longer be our true selves through ‘cosmetic pharmacology,’ to the dawning realisation that they are unreliably useful but side-effect-ridden tools that can help manage difficult moods. From their first appearance in the late 1980s until recently, SSRIs were an A-list topic of debate in the culture wars, and the rhetoric, whether pro or con, was red hot. Antidepressants were going to heal, or destroy, the world as we knew it. Those discussions now feel dated. While antidepressants themselves are here to stay, they just don’t pulse with meaning the way they once did. Like the automobile or the telephone before them, SSRIs are a one-time miracle technology that have since become a familiar—even frumpy—part of the furniture of modern life. At some point recently, they’ve slid into the final act of Mickey Smith’s wonder-drug drama. And in the aftermath of that change, many of the things that people used to say about them have come to sound completely absurd. It’s a wonderful piece that perfectly captures the current place of antidepressants in modern society. It’s by author Katherine Sharpe who wrote the highly acclaimed book Coming of Age on Zoloft which I haven’t read but have just ordered. Link to ‘The silence of prozac’ in The Lancet Psychiatry.